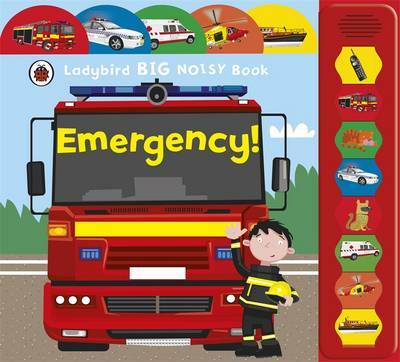 The Ladybird Big Noisy Book - Emergency! is the perfect sound book for vehicle-mad boys and girls! Nee-naw! Nee-naw! Emergency! Whenever there's a problem the rescue vehicles arrive on the scene. Find out about all the most exciting vehicles, from fire engines to helicopters, as you play along with the noisy siren sounds. This big noisy book is perfect for children aged 2 and above. Children will adore this sound book with eight exciting emergency services sounds they can press as they read along. Why not try more wonderfully noisy sound books in the Ladybird Big Noisy Book series including: Dig it! Build it!, Farm Hullaballoo! and many more.